The Orchard Lake Schools Ladies Day Dinner is an annual event that started in 1969. The Gala was started by the women of Orchard Lake to help raise money to support the schools. The Ladies of the Committee start working hard on the event each year several months before the event to sell tickets, plan the meal, coordinate the auction including collecting donated prizes, planning and preparing decorations and preparing prizes to be won at the event. This year the Ladies Gala was held on Sunday, August 29, 2010. The money raised from the event helps to support the seminarians of SS. Cyril and Methodius Seminary and the young men of St. Mary‘s Preparatory. It is tradition to celebrate this special Day starting with a Mass. The Mass was said by three Emeritus Cardinals: Edmund Szoka, Adam Maida and special guest from Poland, Józef Glemp. 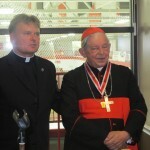 This year the Ladies Gala were privileged to honor Emeritus Cardinal Józef Glemp from Poland. 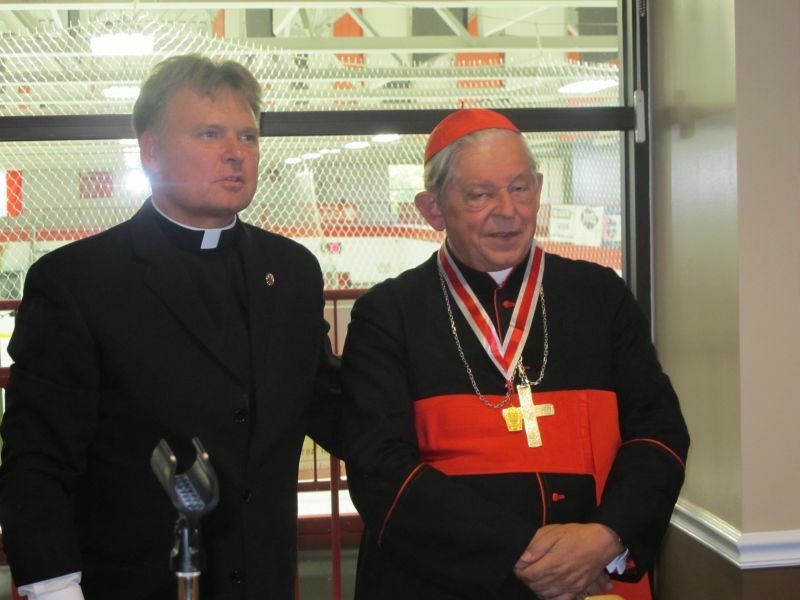 The Fidelitas Medal award was establishment in 1949, and is made to the persons in recognition of their fidelity in serving God, country and the Orchard Lake Schools through the realization of the religious and cultural ideals of polish forefathers. The “Fidelitas” award is the highest honor and most prestigious award given by the Orchard Lake Schools. Some previous recipients of the Fidelitas Medal are Dr. Zbigniew Brzezinski of Washington, D.C., the late John Cardinal Krol of Philadelphia, the late Senator Edmund Muskie of Maine, the late Dr. Czesław Miłosz of Berkeley, California, the late Judge Frank G. Schemanske of Detroit, His Eminence Adam Cardinal Maida, Archbishop-Emeritus of the Archdiocese of Detroit, and His Eminence Stanisław Cardinal Dziwisz of Kraków. His Eminence Józef Cardinal Glemp, 80, was born December 18, 1929 in Inowroclaw, Poland, in the Archdiocese of Gniezno, the son of a salt miner. His father, Kazimierz, had participated in the insurrection of Great Poland 1918-19. During the Nazi occupation Glemp was forced to work in the country on a German farm and became well-acquainted with hard physical work. He finished elementary school after the outbreak of WWII, but only after the war ended in 1945, was he able to study secondary level classes at the School of Jan Kasprowicz in Inowroclaw, earning his diploma in May 1950. Two months later, in July, he entered the Archdiocesan Seminary of Gniezno and was ordained a priest on May 25, 1956. After two years of pastoral service, he was sent to Rome to study Canon Law at the Pontifical Lateran University, earning his doctorate in 1964, with his thesis, De evolutione conceptus fictionis iuris. After his practicum he was given the title of Advocate of the Roman Rota. He completed courses in stylistic Latin and ecclesial administration at the Pontifical Gregorian University. With his studies completed, he returned to Gniezno, becoming chaplain of the Dominican and Franciscan Sisters and teacher of religion in the house for delinquent minors. He served as Secretary of the Seminary of Gniezno and as notary for the Curia and the metropolitan tribunal, as well as defender of the bond. In December 1967, Glemp began service under Cardinal Stefan Wyszynski in the Secretariat of the Primate. Remaining there for 15 years, he was one of Cardinal Wyszynski’s closest collaborators. As Wyszynski’s personal chaplain, Glemp accompanied him on his journeys within Poland and to Rome. He exercised various responsibilities in the Commissions of the Polish Episcopate and taught Canon Law at the Academy of the Catholic Theology in Warsaw. He participated in several congresses on this topic in Poland and abroad. In 1972 Glemp was named chaplain to His Holiness Pope Paul VI. In March 1976 be became Canon of the Metropolitan Chapter at Gniezno. In March 1979, His Holiness John Paul II named him Bishop of Warmia, in the northeast part of Poland. He was consecrated on the feast of St. Adalbert on April 21 in Gniezno. With the death of Cardinal Wyszynski in May 1981, Glemp was named Archbishop of Gniezno and the Archdiocese of Warsaw on July 7, 1981. With this appointment came his role as the Primate of Poland. Glemp was elevated to the College of Cardinals by John Paul II on February 2, 1983. He became Titular Cardinal Priest of St. Maria in Trastevere, Italy. As the Archbishop of Warsaw, he served as the Primate of Poland. Glemp was one of the cardinal electors who participated in the 2005 papal conclave that selected Pope Benedict XVI. As directed by Benedict XVI, Glemp remained Primate of Poland until December 18, 2009, his 80th birthday, when he retired to Emeritus status. Thanks to the Ladies Day Committee for inviting the Polish Weekly. We have spent amazing afternoons with groups of friendly ladies deeply involved in supporting SS.Cyril & Methodius Seminary. This was a wonderful day for everyone. This year Mrs. Julia Serafin chaired the Ladies Day Events. If you are interested in attending the next annual Gala, making a donation or would like any further information, feel free to contact the Ladies Day office at 248-683-0411.